The Fort Worth Country Day library program serves as an essential link between the students and faculty and their information and reading needs. FWCD maintains two separate library facilities. The Lower School Library serves grades JK-4, and the Moncrief Library serves grades 5-12. Staffing includes three professional librarians and one full-time assistant. 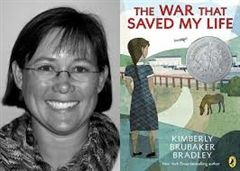 FWCD Libraries welcome Kimberly Brubaker Bradley (The War I Finally Won, The War that Saved My Life) to campus on Friday, March 29. A No. 1 New York Times best-selling author and Newbery Honor Winner, Bradley is the author of 17 novels aimed at children and young adults. The War that Saved My Life follows the heart-wrenching story of a brother and sister evacuated from London to the English countryside during World War 2. FWCD students are participating this week and next in grade-level book clubs in preparation for the author’s visit. The FWCD community is welcome to attend the presentation on March 29 to learn more about the process of writing historical fiction for the middle grade/YA audience. To produce information literate citizens who know how to access and evaluate information. The FWCD Libraries house more than 30,000 book titles and 40,000 copies. In addition, an increasing number of library materials come in digital format, allowing students access from home as well as school. These include downloadable e-books and audiobooks on Destiny Discover; middle-grade fiction on FollettShelf; the Historical Newspaper Collection from Newsbank; and databases of thousands of scholarly journal articles from Gale, EbscoHost, and JSTOR. The library also subscribes to tools that help meet students’ literacy and research needs. These include NoodleTools, an online citation maker which guides students in the process of creating works cited lists, and Renaissance Learning’s Accelerated Reader and STAR, which assess reading skills. A complete list of library resources is available at fwcd.follettdestiny.com. Students in grades 3-8 participate in Accelerated Reader, which is designed to encourage reading practice and careful reading of a text. Assessment involves a computerized test on a book. Find AR books with the AR Book Finder (no password needed). Lower and Middle School students have the opportunity to meet and interact with well-known authors and illustrators on campus each year. Grades K-7 participate in the annual Scholastic Book Fair in the Moncrief Library. In addition to buying books for themselves and family members, students are also encouraged to purchase books for deserving students at another school through the Books for Kids community outreach program. A summer reading assignment is part of the educational program for all students at FWCD. Faculty who serve on the summer reading committees have attempted to choose books that create pleasurable reading experiences and build enthusiasm for reading. We hope many parents will take the opportunity to read and discuss the books with their children over the summer. For more information about FWCD’s summer reading program, visit http://fwcd.libguides.com/summerreading. Minnesota State University-Mankato - M.S. University of Washington - M.Libr.